What is inbound marketing? Is it a new way to reach your potential costumes or just another buzzword made up by the marketing professionals? How can it help you yield more from your online activities? You can find the answer to these questions and much more in our latest article. We can say that the inbound marketing is a different mindset towards customers, content, advertising, and social media. Inbound marketing intends to build a powerful relationship between your brand and target audience by creating content, relevant to your customers, that makes them want to read more. This kind of marketing helps you reach all people who matter most to your business. It even helps you attract the right visitors, who can turn into leads and then – into customers. Inbound marketing is a business strategy that increases your brand awareness, engages your customers through social media and generates more traffic via SEO. Outbound marketing is exclusively focused on finding customers and persuading them to buy the company’s products and services, without actually listening to what they have to say. It relies extremely on actions and tools which makes the business express their promo messages onе-way. 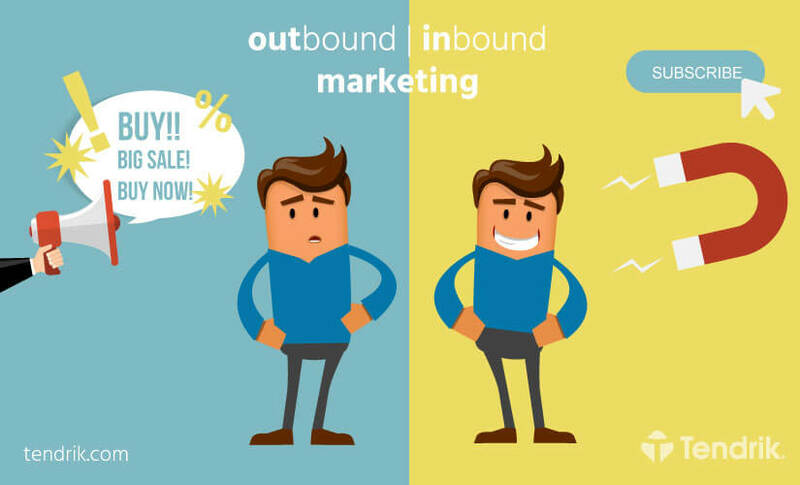 On the other hand, the inbound marketing earns potential costumers’ attention by giving them high-quality information. And heavily relies on building customers’ trust instead of buying it. The Inbound Toolbox contains many different means, which can help you attract visitors to your website. Some of the most powerful tools are: SEO, Social media, AdWords, Email marketing and last, but not least – the content of your website. You can pick one of them or use it all if you want to achieve much bigger results. In order to get noticed as useful by your customer, your website must be teeming with interesting and useful content for you visitors. Tell your readers the whole story and don’t leave the facts behind the curtain. When you are writing for your audience first, you are showing that you care for and respect them. Before stepping into the real content creation, you have to determine how far your customers are from making a purchase. Are they still considering it, about to order your product or service, or are they still getting informed on what your product is exactly? By asking these questions, you can easily pinpoint your content marketing goals. Are you going to inform your readers about something important or are just selling some of your products or services? After clearing all this, you can start choosing the right presentation format of your content. The right presentations you can choose from depend on the purpose of content that you are creating. The types of content presentations include: Video, Infographic, E-book, Presentation, Case study, Checklist, Webinar, etc. You have to consider, if your potential customers would prefer visual content rather than long text. If that is the case, then you should think about a video or an infographic that captures their attention. But if your customers like reading a lot, then you should focus on writing e-books or whitepapers. But in order to turn your visitors in a volunteer marketing army, you have to charm and delight them beforehand. You can do that by triggering strong emotions such as laughter, surprise, provocation or sadness. If you know, that your audience is more likely to interact with something funny, then you have to create content that makes them laugh. And by doing that, you are increasing the chance some of your posts to become viral. The approach you’ll will choose has to be completely related to your audience. If you don’t want to create irrelevant content, leave this work to copywriting professionals. SEO is a good way to increase the traffic from search engines to your website. It helps your website rank higher in SERP, and become more accessible and more visible to your clients, while they are searching for something related to your business. When you dive into the ocean of SEO, you can start with the site structure. Search engines are using bots or spiders to crawl your website. If the structure of your site limits the work of these bots, then it is more likely to appear lower in search results. You can perform an experiment on your own. Try to reach some place on your website and count the clicks that you are making on your way. If you make more than three clicks, then you have to reconsider the structure of your website. If you make three or less than three clicks, then you pass the test successfully! Keywords are another important aspect of the SEO. There are just three things that you have to know about the keywords. They have to be well defined, relevant to your website and repeated (not way too) frequently. But on what type of keywords you should focus – long-tail or more generic ones? There is no perfect answer to this question, but a simple solution, that you can follow if you are online start-up, is to focus on long-tail keyword and leave generic ones for your AdWords campaign. Getting at first place on Google is the Holy Grail for websites out there. If you want to appear in the top 10 search result, but you don’t know where to start, consult with SEO specialists. Maybe you are thinking, should I use social media and what can I achieve with it? You have to know that the social networks changed the way we communicate with each other. They changed marketing and advertising, as well. People no longer respond to pushy commercials, and now they welcome companies and brands in their two-way conversation. Your potential customers are out there and await you to join them on social network to start the conversation. Before jumping into the world of social networks, you have to choose in which one you are going to jump. Start by finding what social network your potential customers prefer. If they are not using Twitter, you shouldn’t use it too. Maybe your costumers are using niche social networks (Instagram or Snapchat for instance), then you have to focus on them, and leave the big ones. Next, you have to share a relevant message with your audience, something that will capture their attention. To do this, you have to identify who your audience is and what interest them. Create content that fit in their news feed, something that will make their thumbs stop on your post. Make your efforts a worthwhile endeavor by creating thumb-friendly content. If you are not familiar with nuts and bolts of social media marketing, then you can leave the work in the hands of an expert in the field of social network. Inbound marketing is a key strategy for you to increase your online sales. If you need services in SEO, social network marketing, paid advertising on Facebook and Google or copywriting, do not hesitate to contact our team!